After a stretch of very rainy weather, Bob and I were desperate to get out in the field, and nothing pleases us more than to explore a new trail or go birdwatching in a habitat never before visited by ourselves. 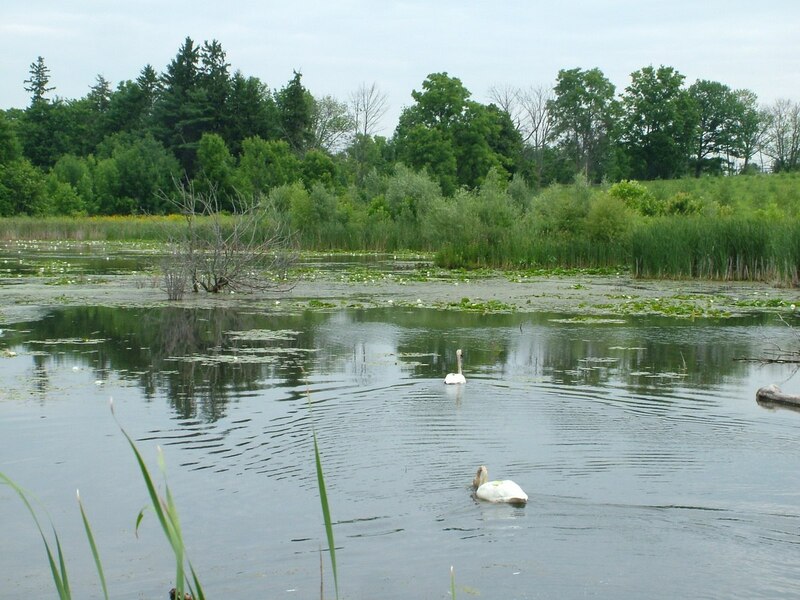 Such was the case when we targeted Lower Reesor Pond, a wetland in northeast Toronto, in Ontario. Our outing, as usual, was prolonged but immensely rewarding. 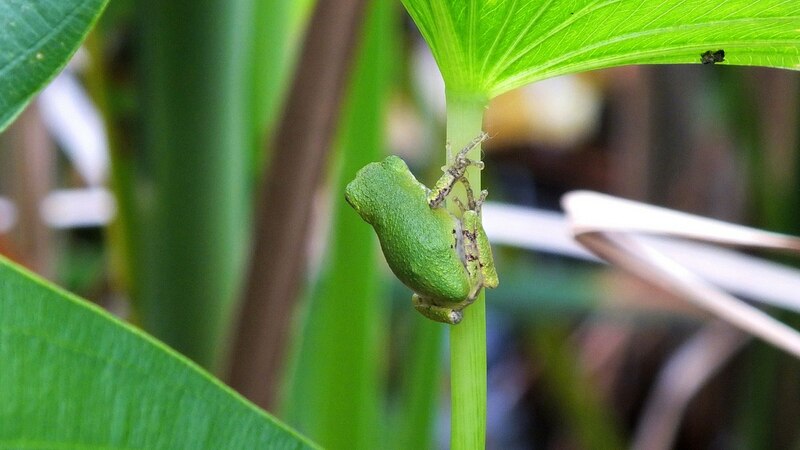 Amongst other birds and animals seen that day were several Eastern Gray Treefrogs. This wetland, from information that I was able to glean off the internet, has only been in existence since 2008. 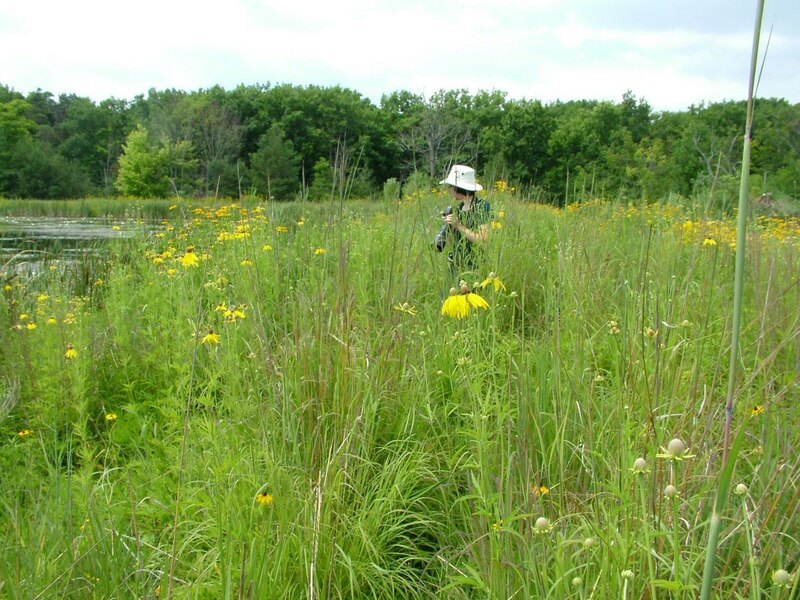 From its humble beginnings as a damp depression in the middle of a farmer’s field, the average-sized pond is now surrounded by a vast rolling meadow to the east and a modest woodlot to the north. The day we visited, several species of birds were on site including a pair of Trumpeter Swans, numerous Cedar Waxwings, and two species of Sandpipers, plus an assortment of turtles, frogs, butterflies and dragonflies. Since Lower Reesor Pond has no inflowing streams or rivers to supply water, it relies on precipitation to maintain the water levels that originate from a vernal pool. Strategically constructed berms along the edge of the pond help to channel water into the basin and, at the same time, provide excellent locations from which to view the bird life attracted to this body of water. 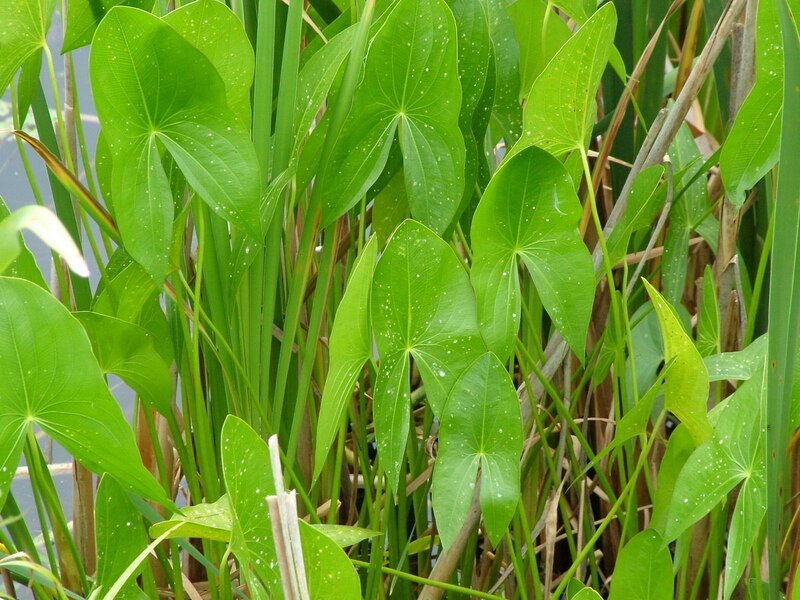 As Bob and I followed the trail along the west and north side of the pond, we remarked about the striking leaves of a large colony of Arrowhead plants (Sagittaria latifolia). Standing so erect with their tips pointed towards the sky, it is impossible not to recognize why the plants were so named. It is surprising to note that the leaves might not always look as they are seen here and may vary considerably from extremely broad to very narrow, from arrow-shaped to lance-like. When I moved in close to snap a photo of the beautiful green leaves, I noticed an unusual blob of green on one leaf. 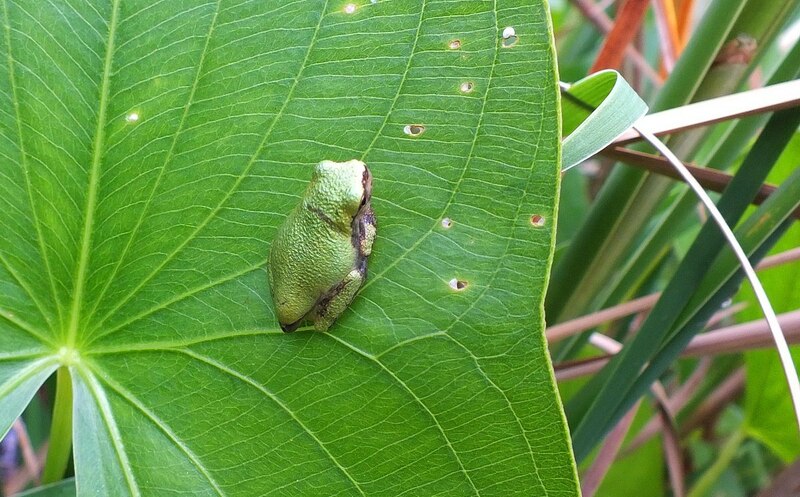 Upon closer inspection, I could see that it was a Gray Treefrog. Even though it is called a Gray Treefrog, as its Latin name suggests, this species of frog actually has the ability to change colours from grey to green depending on its chosen perch. The skin of Gray Treefrogs has a lumpy texture because it is lightly sprinkled with warts, and sometimes the dorsal surface will be patterned with darker blotches that are bordered with black. My photo hints at the bright-yellow wash with black speckles on the hind thighs and legs, but that is more visible when a frog is jumping. 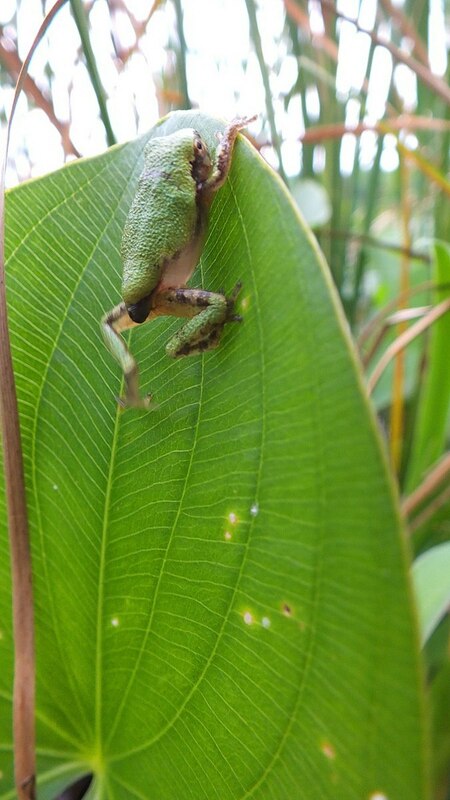 As Bob and I nudged Arrowhead leaves aside for an unobstructed view of one Treefrog, we discovered that there were at least two others on neighboring leaves. but one specimen decided it had better clear out in case we were predators. Eastern Gray Treefrogs are classified as arboreal tree frogs because they have evolved to move about in trees. It is their large, sticky toe pads that make this possible because they grip like suction cups. 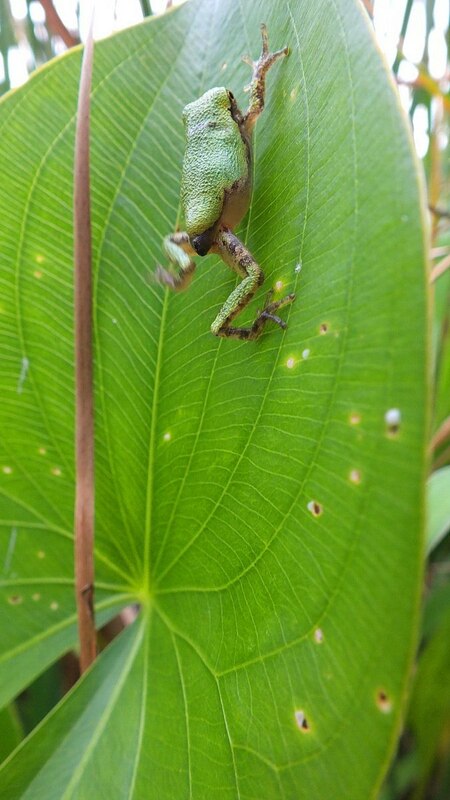 The toe pads secrete a slimy mucous enabling the Tree Frogs to adhere to smooth bark and obviously slippery leaves of water plants. giving us a glimpse of its white belly and pale chin. 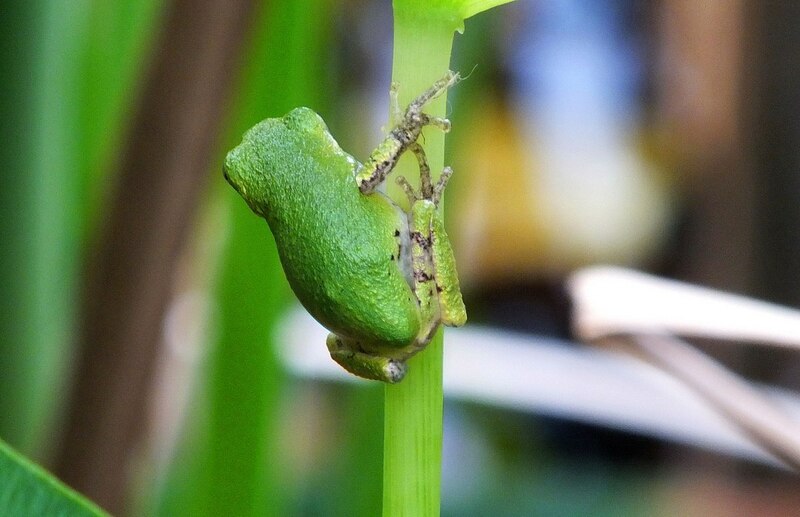 A male Eastern Gray Treefrog will have a black or grey chin and throat whereas a female’s will be lighter in colour. This is because a male Eastern Gray Treefrog has a vocal sac in its throat for the purposes of calling during mating season. Eastern Gray Treefrogs only descend from treetops for the purposes of breeding, which takes place between late spring and early summer. That is when the males gather in vegetation around appropriate ponds and swamps and begin their mating calls to attract a female. The musical trill that resonates from a male frog’s vocal sac is the sole factor influencing a female’s choice. 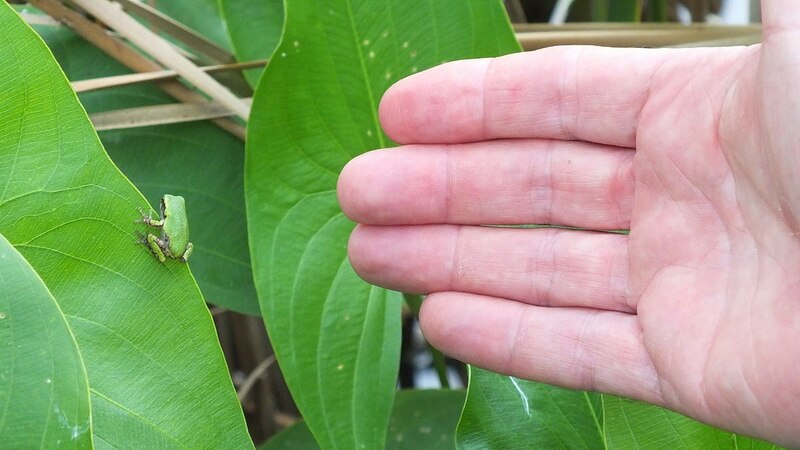 Bob and I could see that the tiny Eastern Gray Treefrogs were each at a different stage of development. Like any frogs, their lives begin when a female lays her eggs in the shallow edge of a quiet body of water. Tadpoles emerge 4 or 5 days later, but it takes a good 2 months or so for the tadpoles to transform, or metamorphose, into young frogs or froglets. 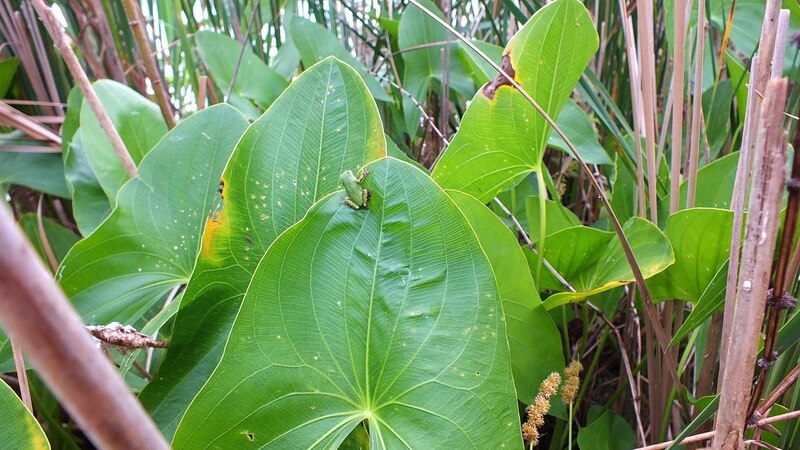 All young froglets start out bright green and remain that colour until they acquire the adult coloration. A couple of the frogs showed no sign of the tail that had existed when they were tadpoles, so we are not sure if they were froglets or adults. 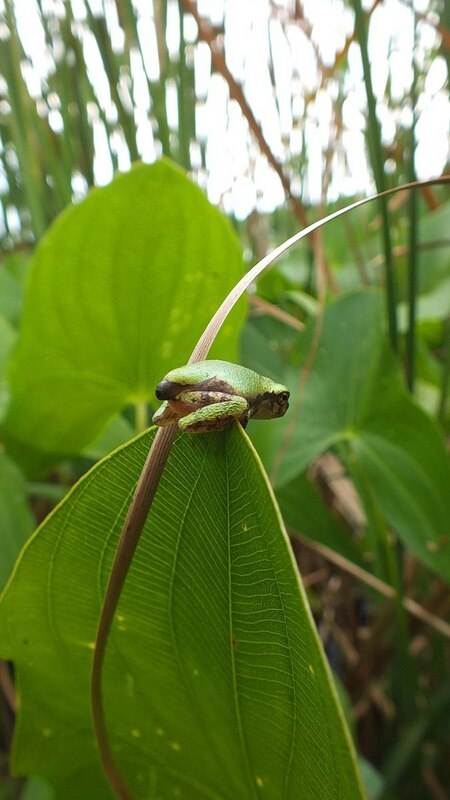 Yearling frogs and adults in breeding season are most often green. 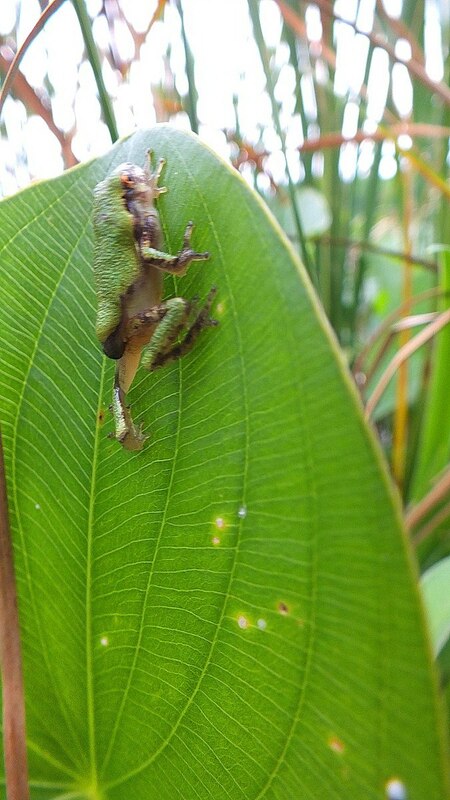 This froglet had not totally completed its metamorphosis and still showed the stump of its tail. 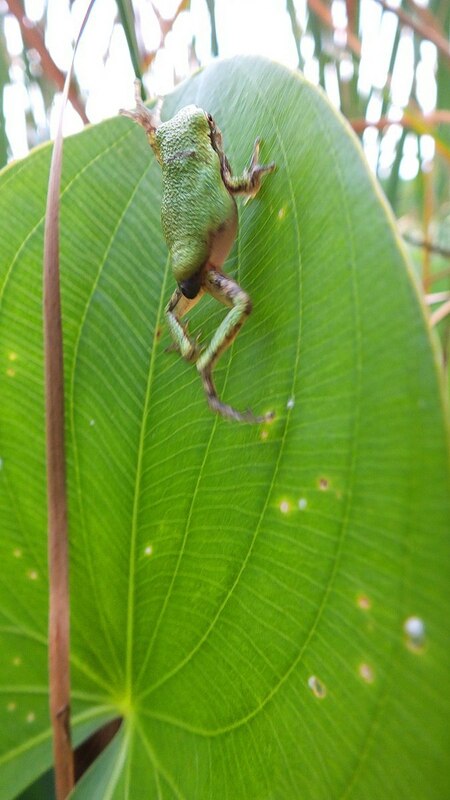 We were amazed at its masterful ability to balance on the tip of a leaf. 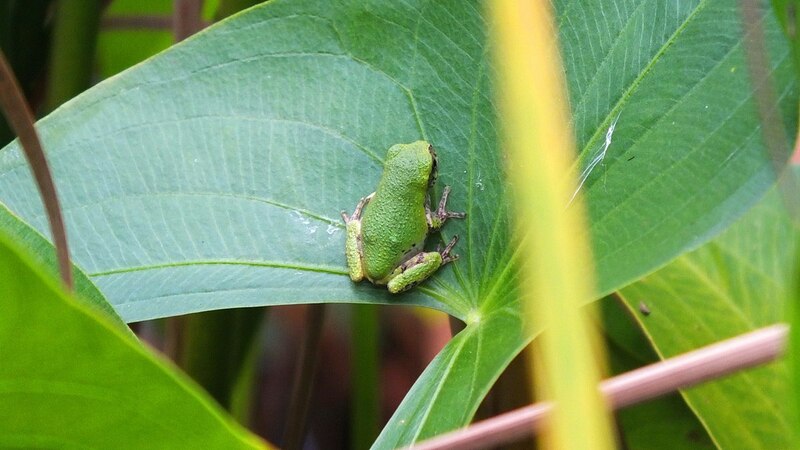 For Bob and me, this was our first ever sighting of an Eastern Gray Treefrog, and we were delighted with the little creatures. 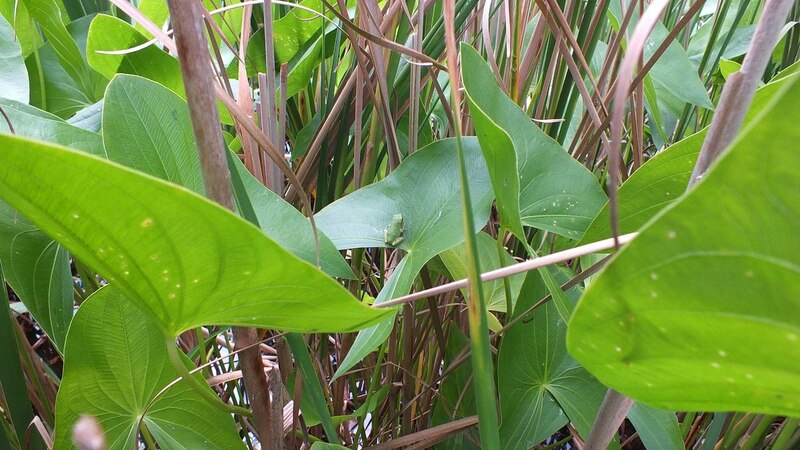 Hidden there amongst the dense colony of Arrowhead plants, they seemed well set to avoid detection by predators. Hopefully, they all lived to see another day.